Peter Finch was born in Cardiff in 1947. He still lives there. Between 1966 and 1975 he edited the international avant garde poetry magazine second aeon and its attendant publications. Second Aeon became a mainstay for the alternative poetries of the day and acted as a bridge between Britain’s warring poetry factions, introducing many traditionalists to what was going on in the new poetries both at home and abroad. An archive of second aeon papers currently exists at the Fales Library, New York and can be viewed here. Peter Finch’s own history of the magazine is here. The London-based Poetry Library has a number of copies of the magazine available online. He ran Cardiff’s Welsh and alternative literary bookshop, Oriel, on behalf of the Welsh Arts Council from 1975 until the mid-1990s. The bookshop became a hub for new poetry and a platform for performances from many of the UK’s leading left-field writers. It held the largest stock of poetry for sale anywhere outside London and when Compendium went down probable took over the lead role. In 1998 he became chief executive of The Welsh Academy, rebranded as Academi and later as Literature Wales. This was Wales’ literature development agency responsible for all aspects of writing in the country. In 2011 he stood down as CEO in order to devote more time to writing. As a poet Peter Finch had always worked near the edge, developing an interest in visual and concrete poetries during the formative sixties and extending that interest as the decades moved on. 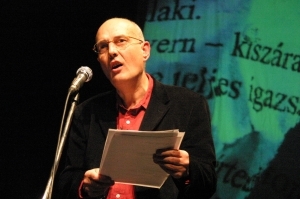 He was an associate and collaborator of Bob Cobbing and was involved with many poetry organisations over the years including the Poetry Society in the decade of the poetry wars, the Association of Little Presses (where he was treasurer) and Poets Conference (where he was Welsh representative). He learnt from art history and has always regarded European models (Apollinaire, Duchamp, Tristan Tzara, the dadaists) as being just as significant as the American avant-gardists who followed them (John Cage, Jackson Mac Low, the LANGUAGE poets). His work often straddles the edge between the alterative, the left field, the edge-pushing new and the performance-orientated and more traditional centre. In Wales he spent decades being ignore or regarded as some sort of literary freak before emerging in the late 1990s and early 2000s as a sort of Welsh avant garde icon, a force for change who had been neglected and now should be honoured. A number of his innovative works are now incorporated into the fabric of the city of Cardiff. These include, at St David’s Two, a visual acrostic made from the names used for the city down the years, a sound poem running across the edge of the Lamby Way landfill and a spiral permutation outside South Wales Police Headquarters. He is as interested in the visual as he is the way words make their sounds in the air. His believes, like Clark Coolidge, that we have so many words out there that we rarely need to make new ones. Replacement, permutation, discovery, and randomness can be as powerful as pulling the work out of thin air. He does both. Key works are The Welsh Poems (2006), Antibodies (1997), Selected Poem (1987), Selected Later Poems (2007) and Zen Cymru (2010). There is a collected visual works at the planning stage. dlt n clpp n t wnk f m il.